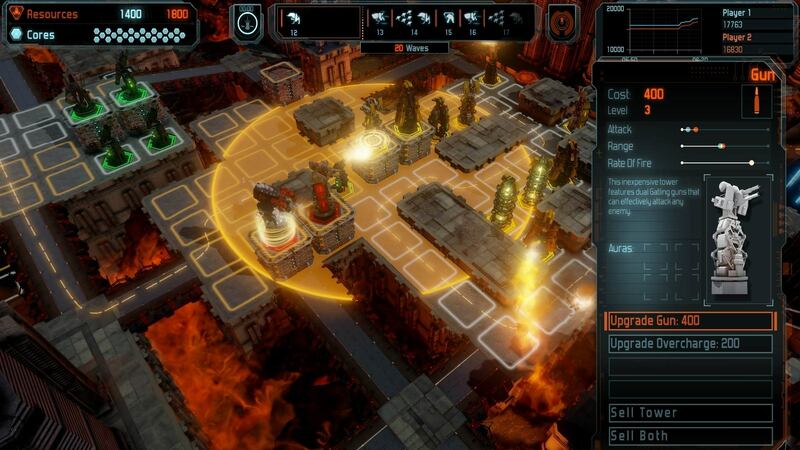 Defense Grid 2 is a relatively simple game with a lot to offer. On the face of it, Defense Grid 2 is a basic tower defence game with some colourful sci-fi flare, but this game is more than a sum of its part. Its predecessor rose to prominence with solid tactical combat that brought the genre out of the flash game market, but with a host of DLC packs, including collusion with GLaDOS of Portal fame, what more could a sequel bring? Quite a lot actually. With twenty maps each designed to make you change-up your way of thinking, ten towers to slaughter aliens with, and dozens of enemy types, you’ll find what looks repetitive on the face of it, has a lot to keep you busy. If you’re familiar with Defense Grid 2, you’ll know the basic premise, there are cores you must protect by killing the aliens that are coming to steal them. If you’re new to the series, that’s about it, like I said, it looks simple. On top of the standard slog through the story, which involves the aliens stealing AIs as well as cores, they’ve included a lot of other ways to play each map. This can either be by limiting what you have available, or making the game an endless loop and asking how long you can survive for (the short answer is not as long as you’d expect). This makes the game last so much longer, and with its detail to and balance fairness, it’s not merely extended by difficulty. If you fail, that’s on you, and you can improve. 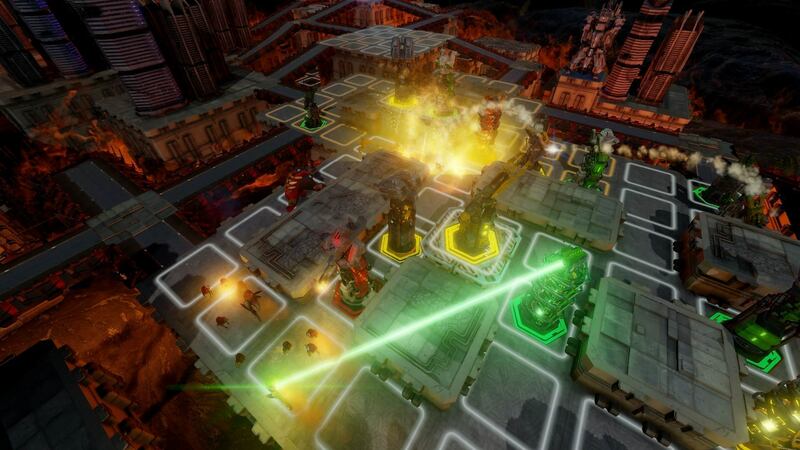 The biggest shake up Defense Grid 2 brings to the series is multiplayer. Although tower defence games rarely had many options for playing with someone else, DG2 has some impressively creative ideas. Co-op is easy enough, either playing normally or where you only have certain areas to work with, forcing you to coordinate, but it’s the competitive side that holds the most intrigue. While both players still build towers to kill aliens, your efficiency is there defeat. Every time you kill an alien on your side, it spawns on theirs. The object is simple, kills enough of your aliens to overwhelm your opponent, but the strategic side is challenging as you struggle overcome your competitors respawned swarm. You will undoubtedly spend hours playing Defense Grid 2, while the earlier levels sucker you in with trance like progression, the later levels with test your knowledge, and playing online will make you completely rethink your normal strategy, although there are a few small issues that might grate on you. As with our Xbox One review, the chorus of gunfire, explosions and electricity is unpleasant at best and mind-boggling at worst, but is fixable through some menu tweaks. What got me more, was the size of the writing. While this isn’t practically important after you’ve gotten to grips with the building and upgrading system, the mid combat text is just too small to read from any distance, and you don’t have time to be squinting at screen while your cores are being stolen. Its’ a shame, but does ware off once you know what to expect. The story isn’t exactly involving either, but with some amusing lines of dialogue you can’t ask for much more really. It’s a game where you build towers with guns on to kill aliens before they steal your shiny balls, don’t expect much. This does however give the developers license to use all manner of interesting and pretty locations, from jungles to volcanoes and even space. You’ll spend longer on this game then you realise at first, but once you understand the ebb and flow of enemy waves, the strengths and weaknesses of each tower, and all the modes to choose from you’ll know just how long you spend beating your scores and grinding the waves, and you’ll love every second of it.